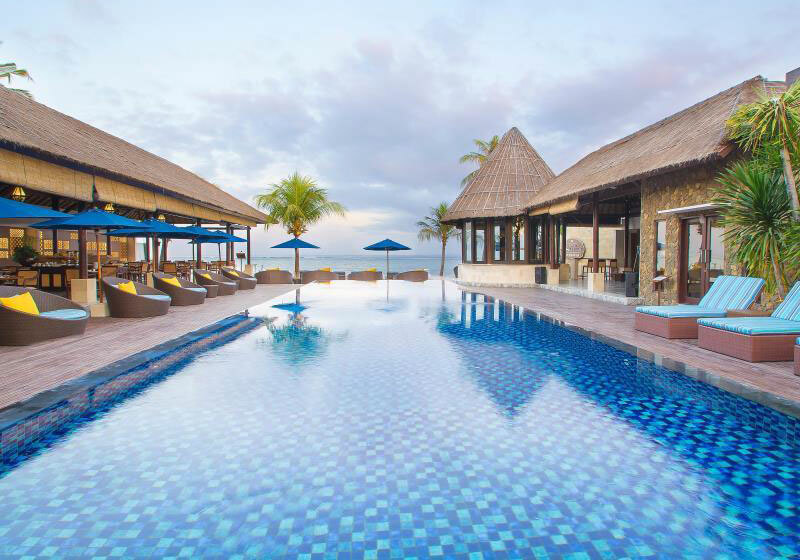 Lembongan Beach Club & Resort is set on Jungut Batu beach, Nusa Lembongan, Bali. Our Beach Club Resort is made up of just 37 private villas, most with swimming pools, Designed with natural materials in a modern balinese style each villa provides ample personal space to retreat. The Beach Club Restaurant overlooking the ocean and Shipwrecks surfing break, offers mouthwatering international and local cuisine. Situated on the beach front, one can relax in our infinity pool whilst enjoying the stunning sunsets and a signature cocktail. Discover Nusa Lembongan’s plethora of sites and activities, with world class diving, surfing breaks and stunning corals to enjoy. Spend a day on dream beach soaking up the sun or delve beneath the surface into the historic cave house. Lembogan Beach Club & Resort provides an unforgetable accommodation experience and base to explore the still undeveloped Nusa Lembongan. Short Description: Lembongan Beach Club & Resort is set on Jungut Batu beach, Nusa Lembongan, Bali. Our Beach Club Resort is made up of just 37 private villas, most with swimming pools, Designed with natural materials in a modern balinese style each villa provides ample personal space to retreat.